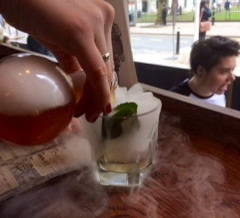 The Alchemist turns into something of a science lab behind the bar with smoke from dry ice billowing and bunsen burners helping to infuse flavours together - but that's all part of the mixology magic. The Alchemist opened its branch in Birmingham in Colmore Row - just a few steps from Snow Hill Train Station - in September 2016. Since then, it's become one of the main cocktail hotspots in the city. With an overflowing menu of cocktails to choose from (including a few non-alcoholic ones too), you can easily spend 20 minutes or so deciding what to have. 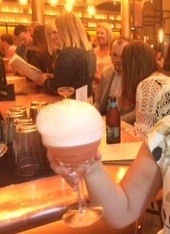 Yes, there's a few of the common favourites like a Long Island Ice Tea or Porstar Martini but expect a roll of the eyes from the impressive bar staff if you order these as they are just itching to make the more extravagant and extraordinary cocktails that The Alchemist has become famous for. 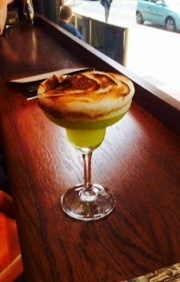 For flavour, there's the cocktail that tastes just like Key Lime Pie, or in the same vein, The Battenburg or Peaches and Cream that all taste amazingly like their food namesakes but in a very potent, beautifully presented liquid form. With plenty of contraptions, infusers and flames at the ready, you could opt for the more technical options of the colour changing cocktail or the one that changes flavours the further you sip down the glass. It's all a bit Harry Potter and you half expect a cauldron to appear bubbling over in the corner. Sophisticated and stylish, it's also versatile enough to make it ideal for drinks with friends and family or romantic for a date or anniversary. It attracts all ages who are interested in something a bit more fun and elaborate than just the normal glass of wine or beer ( which they do also sell). It's based in the former Grand Hotel building opposite the Cathedral, which you can look out at from the few outdoor tables. Inside, there's three seated booths in the bar area but mainly stools around the room - unless you are eating in the adjacent restaurant where you can reserve one of the many tables. The average cocktail costs between £7 and £10 and there are also sharers for £20, like the dazzling Mad Hatter that infuses fruit and herbs with rum and other booze before being poured into a teapot. 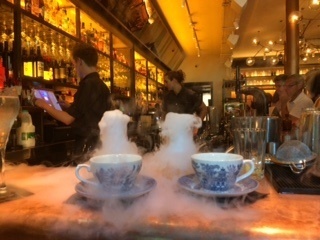 You can then get involved in the magic by pouring it into teacups with dry ice so it has a smoky, dreamy air to make you feel like Alice in a cocktail Wonderland. It's become a favourite haunt for after work drinks, hen dos and celebrations as it is open until 11pm on Sunday, to midnight from Monday to Wednesday, until 1am Thursday and 2am on Friday and Saturday. To check out the full cocktail menu, visit The Alchemist website.